The redesign would make bus service faster and more reliable for thousands and greatly improve safety for people on bikes. Denverites could see faster buses and safer bike lanes along 18th and 19th streets downtown. Denver Public Works is working with RTD to redesign the streets between Broadway and Wynkoop Street. We could see the changes sometime next year. 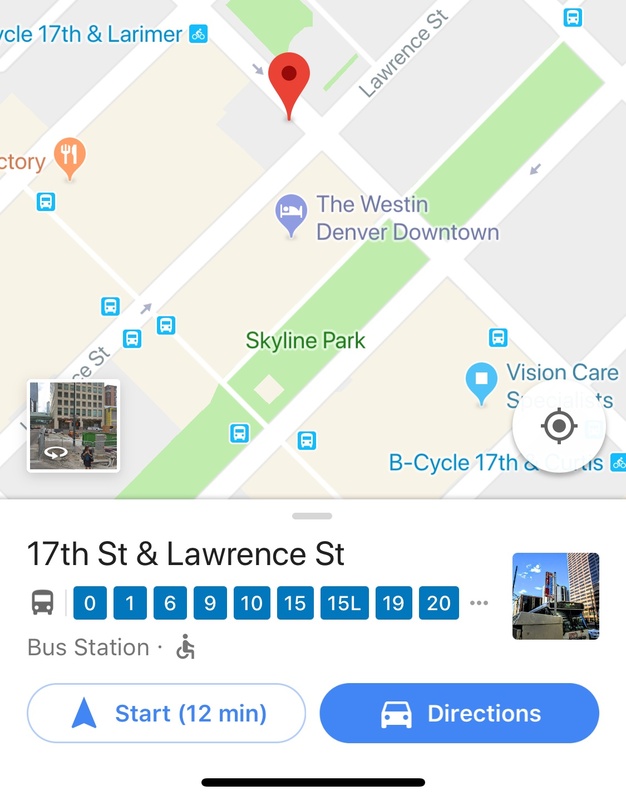 RTD’s Free MetroRide service, a circulator that ferries people between Union Station and Civic Center Station, gets bogged down in traffic on 18th and 19th, as do other downtown bus lines. Bus-only lanes and signal adjustments that give transit a head start at intersections would make service faster and more reliable for thousands of daily riders, said Ryan Billings, a transportation planner with DPW. The agencies have yet to decide whether the bus lanes may will be in effect 24/7, or only during the morning and afternoon rush hours. The project would also create much better conditions for bicycling. Currently there are bits and pieces of painted bike lanes on 18th and 19th, but it’s stressful for people on bikes. The “bike lane” on 19th is actually a shared lane for buses, high-occupancy vehicles, and bicyclists. In the redesign, continuous bike lanes would extend the length of the downtown streets, with protection from traffic in the form of curbs, plastic posts, or planters. To make room for the changes, DPW may re-purpose a travel lane or a row of parking, depending on the street segment and public feedback, Billings said. The redesigns are still in the early stages. Okay, since I’m on this blog, walk me through something. I tried to find/search what bus routes use 18th & 19th Streets and all I could find was Metro Ride which btw stops running at 7:00 pm. According to google, 9 bus lines use 17th st. Dedicated bus lines there and on 15th should be no brainers. Supposedly there is a “Denver moves transit- downtown” plan kicking off next year. Don’t ask me why we need to study this for another year before making these changes. They are probably starting with 18th/ 19th because the infrastructure is already half built but clearly 15th and 17th should take priority. Several routes use 18th and 19th. The 0, 1, 15, and 20 all use 18th for at least a few blocks heading toward Union Station. 19th has several express lines like the Flatiron Flyer on their way to Civic Center as well as the 28, 38, and 44. Agree that 15th and 17th should have dedicated bus lanes as well, a lot of buses there! Had to hunt for a previous planner/blogger comment on SSF from October. It also included discussion of when a downtown tunnel was conceptualized back in 1986. I mean, how many bus transit tunnels are there in the US? If I’m a city, I’m looking to dedicate space at the street-level first, then consider grade-separation when warranted (as part of bigger package). 15th moves like 300-400 buses a day, same for 17th. 18th does similar numbers in a few sections. I think Seattle bus tunnel is doing 80 buses an hour (plus similar numbers for 4th at street-level). If you were to design routes (I have no idea what they currently do) so that bus/routes don’t all make the same identical stops then reserving two lanes for buses would allow buses to pass/skip ahead of other buses as they moved along 17th St (for example). But w/o that ability then every bus needs to stay in line as buses in front make their next stop, one by one. Two dedicated lanes might only apply during say the two busiest hours of each commute period so you could move a lot of buses and people through during that time frame. I have seen this problem sometimes. On the Lincoln St bus lane for example, limited and express buses move out of the bus lane to pass stopped local buses. But on say, a snowy day where traffic is bad, they aren’t able to do that and end up stuck behind a local bus making all the stops. I think most of the time you can solve this if the right lane is for parking / bus stops, and the next lane over is dedicated bus lane. Then the buses can be passed while they are stopped. Downside is cars parking have to cross through the bus lane and sometimes block it wile trying to parallel park. I can be a little slow but I have no idea the benefit of signal priority on dedicated bus lanes? What they should consider is eliminating parking and having two bus lanes and two car lanes. This would allow buses to pass each other, assuming they don’t all make the same stops, which could make a yuge difference. It’d be great to continue the bike lanes East on 19th Ave and 20th Ave, and maybe 17th and 18th. Very hard to go East West on a bike in this area, they’re all fast multilane one way streets with janky intersections.